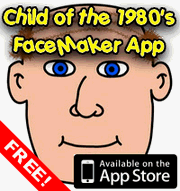 The eighties was a great decade to have grown up in, there’s no doubt about that, but as with most decades us children of the 1980’s still have the possibility of a few old photographs in the family album that we look at and cringe in horror at what we looked like. When people think of hair styles from the eighties the term “big hair” is often used, and the Mullet falls nicely into this group. From the front and sides, the typical Mullet looked fairly smart, with a nice centre parting or perhaps back combed or slightly spiked. Yes, for the most part (there are exceptions) the front looked OK. It was the back that let the Mullet down. The hair was allowed to grow long, normally to around shoulder length, which on a bloke (for the Mullet was first and foremost a male hair cut) that always looked a bit wrong. It gave the effect that you had gone to the barber and only had enough money for half a hair cut, so the barber didn’t bother doing anything at the back. 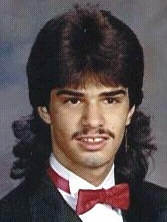 Why did the Mullet catch on? Well, for some reason footballers and other sportsmen took a liking to the style, so of course impressionable young boys wanted to look like their sporting heroes. Pop stars also liked the look (I’m looking at you a-ha, but there were many more) so they were another big influence. Oh, and there was DJ and Fun House presenter Pat Sharp, who sported a particularly large Mullet for far too long, although I don’t suppose there were many boys who went into the barbers and said, “make me look like Pat Sharp“. Both Li’l Boo (my wife) and myself have fond memories of the Monster books from our early childhood. Like the books featuring Roger Red Hat and company these books were a series which many primary schools had for helping teach children to read. They were written in the early seventies, but schools being schools they were still to be found in libraries well into the eighties, and probably beyond. The books were written by Ellen Blance and Ann Cook, who drafted in the help of children to make the text read as if a child had written it. Illustrations were provided by Quentin Blake, who’s sketchy style suited the books brilliantly. From the illustrations Monster was vaguely humanoid, but must have been at least eight feet tall. As if that wasn’t enough to make him stand out in the crowd, he was also a pretty shade of purple. From day to day monster didn’t wear clothes, or if he did it was a skin tight lycra jumpsuit. In common with many cartoon characters who generally wear nothing, he did wear clothes to aid with the storytelling. For example, in one book he goes for a bike ride, and wears a T-Shirt and shorts to do so. Monster lived in a house with his friend, a little boy who was always just referred to as the Little Boy. 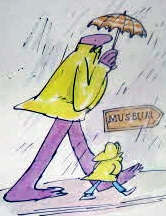 The pair got up to all kinds of adventures as the Little Boy taught Monster about the world, and Monster helped people out with the aid of his magic umbrella, which could turn into different objects appropriate to the story. At first the big purple Monster was all alone in a human world, befriended only by the Little Boy and other children. Before long though, a “girlfriend” for Monster was created, named simply Lady Monster. She looked almost exactly the same as Monster, except she had long hair (Monster was bald) and she normally wore a dress – at least she had grasped the concept of covering yourself up! Unsurprisingly Lady Monster also had a little child friend, who was called… The Little Girl. No prizes for guessing that one! A few years back we tried tracking down some copies of the Monster books, which we managed to do both in the UK and the US. We ended up with some duplicates of a couple of the stories, and in particular one book (Monster and the Toy Sale) was interesting to see the difference in the two versions. The UK version mentions a “traffic policeman” whilst the US version uses the phrase “traffic cop”. I guess UK book publishers were a bit more prim and proper back then than they are now! I recently ran a competition to win a bag of the newly relaunched Galaxy Counters. Not the worlds biggest prize perhaps but a great many of you have got quite excited about this particular sweetie returning to shop shelves, and we had a great collection of entries. Sweets from the penny counter in the corner shop, then the long walk back up a steep hill with friends while munching the huge bag of sweets that cost no more than 10p. Well said! The closest you generally get to this now is Pick ‘n’ Mix (taken over by Tesco, WH Smith and others now. RIP – Woolworths stores) which is the same sweets sold by weight, not quantity, which means you generally get far less for your money. Ten pence would probably get you one pink foam shrimp now if you were lucky. Are You a Yo-yo Trickster? I wrote this week about the fad for playing with Yo-yos that swept across my school during the eighties. Working out how to do new tricks became quite a competition between my friends for a time, and whilst I wouldn’t say any of us got to be experts, we had a good time trying until the craze past and we moved on to whatever the next thing happened to be. Keeping with the Yo-yo theme then, this weeks survey is to find out how many of you could do tricks with a Yo-yo. And if all you could do was make it go up and down the string then that doesn’t constitute a trick I’m afraid. Can you do tricks with a Yo-yo? Now, I’m by no means claiming that the Yo-yo was solely a toy of the 1980s. Indeed, in it’s current form as a toy it dates back until at least the 1920s, and records date it back to being a hunters weapon in the Phillipines during the 16th century, and there are even examples of Yo-yo like objects being used in ancient Greece, dating back to 500BC! 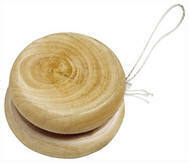 However, there was a sudden fad for the Yo-yo when I was at secondary school, which is why I’m writing about them. A friend of mine brought his into school one day and started doing a few very simple tricks with it. Up to that point I had of course played with a Yo-yo before, but all I ever did with it was make it go up and down the string, which got a bit boring after a while. My friend kept throwing his Yo-yo out in front of him and looping the loop with it, and at that point I was hooked. At the first opportunity I went Yo-yo hunting, and I ended up with a cheap metal Yo-yo that was blue with a picture of a panda on it, but it was all I could find, so it would have to do. I started practising and before long was copying my friend’s tricks of throwing the Yo-yo out horizontally, or performing loops. I triumphantly demonstrated my new skills to my mate, who then went on to show me his new trick. He called it “the spinner” but I later learned the accepted term for it is a sleeper. With a sharp flick of his wrist he sent the Yo-yo to the bottom of the string, where it stayed, spinning round and round like mad, instead of rolling back up the string. He then slapped the back of his Yo-yo holding hand, and it climbed back up the string into his hand. There have been many TV shows about heroic animals (mostly dogs) who help people in need. Way, way before my time there was Rin Tin Tin, and there have been many different versions of Lassie. Leaving canines behind for a bit we also had Flipper the dolphin, Gentle Ben the bear and of course Skippy the Bush Kangaroo. 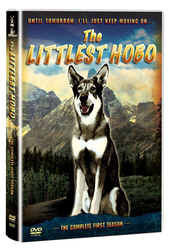 However, the one I remember most from my childhood has to be The Littlest Hobo. The first series of The Littlest Hobo was made in the sixties, but in 1979 a remake was made and this is the version I am writing about today. The show didn’t make its way to UK TV screens until the early Eighties, but it soon became a staple part of the children’s TV line up from the BBC for many years. The first series is to be released on DVD for the first time on Monday 26th April 2010, so you can relive the adventures of the amazing German Shepherd for yourself. The Box Set consists of four discs, containing 24 episodes of doggy delights, which have obviously been through some kind of remastering process as the picture quality is actually much better than I expected. Even when I was a kid I remember the image always seemed a bit colourless when it was shown on TV, but here it’s quite vividly coloured and is quite high quality. In places some of the people seem to suffer from a bit of a halo appearing around them, but it’s normally only when you have scenes containing very light and very dark objects at the same time. When you’re a kid there’s something strangely funny about bodily functions, so whoever came up with the idea of making fake plastic dog poo was certainly on to a winner. It might be disgusting to us adults (although I’m sure a wry smile came over your face when you saw the picture) but every kid would simply go mad over their own piece of plastic dog doings. 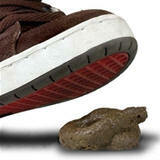 If you happened to have a dog this cheap trick was a great way of getting your Mum all worked up with the dog. Simply place it somewhere in the house (carpet was always the best, as it would be the hardest to clean if it had been real dog poo) and wait for your Mum to discover it and start telling off the dog. From a distance this toy was surprisingly realistic, and it even had that classic dog poo shape, all twisted round on itself like the dog had been wiggling its backside about whilst it did its business. The good news is for all you childish pranksters out there, you can still get hold of this joke item. Once such place is the Stocking Fillers website. Think of British comedy double acts and chances are the first names that will come to mind are Morecambe and Wise. Their shows, particularly the Christmas specials, pulled in millions of viewers, so when they left the BBC to go to ITV it understandably left a big hole in the BBC’s comedy programming. So who did the BBC get to plug this hole? Well, they already had The Two Ronnies, and Cannon and Ball were signed to ITV, so they were left with Little and Large. Oh, and Les Dennis and Dustin Gee, until Dustin died from a heart attack in 1986. The Two Ronnies did well for the Beeb, both at the time and later when they’re shows were put out again and again in slightly modified repeat formats. Little and Large however, didn’t quite manage to stand the test of time so well, despite featuring all the classic double act features. 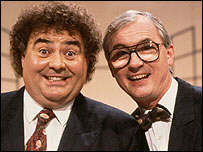 Eddie Large (real name Edward McGinnis) was the “funny one”, with a range of impersonations and put downs to “straight man” Syd Little (real name Cyril Mead), who always tried to sing a song, but kept getting interrupted by his cohort. For some reason Eddie always introduced Syd as Supersonic Syd Little, but I never quite understood why. Depending on how you looked at it the Little and Large monikers were possibly the wrong way round, since Syd was taller than Eddie – but then Eddie was more rotund than Syd, so they must have been measuring themselves by width, not height.